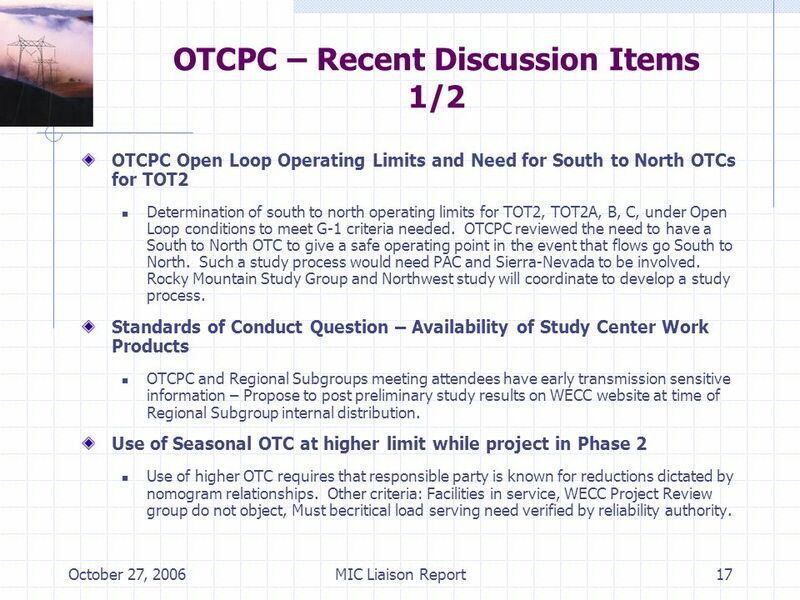 17 October 27, 2006MIC Liaison Report17 OTCPC – Recent Discussion Items 1/2 OTCPC Open Loop Operating Limits and Need for South to North OTCs for TOT2 Determination of south to north operating limits for TOT2, TOT2A, B, C, under Open Loop conditions to meet G-1 criteria needed. 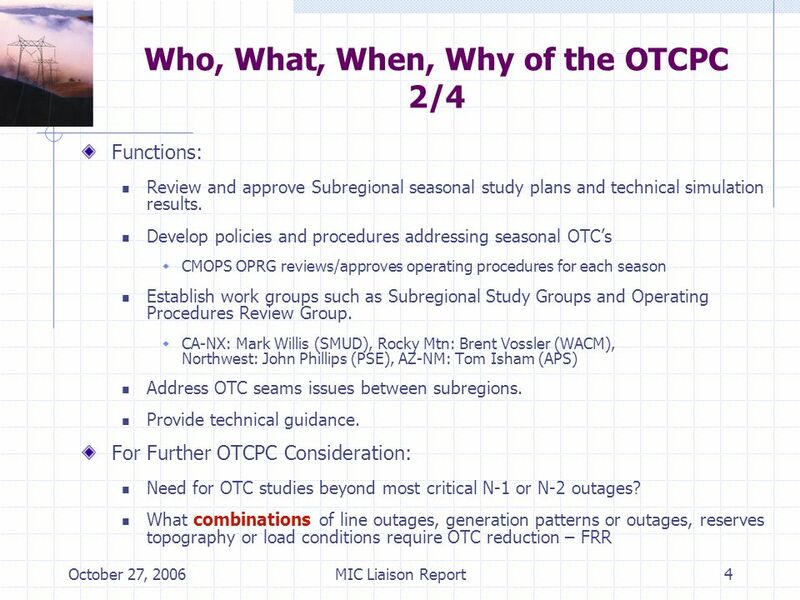 OTCPC reviewed the need to have a South to North OTC to give a safe operating point in the event that flows go South to North. Such a study process would need PAC and Sierra-Nevada to be involved. Rocky Mountain Study Group and Northwest study will coordinate to develop a study process. 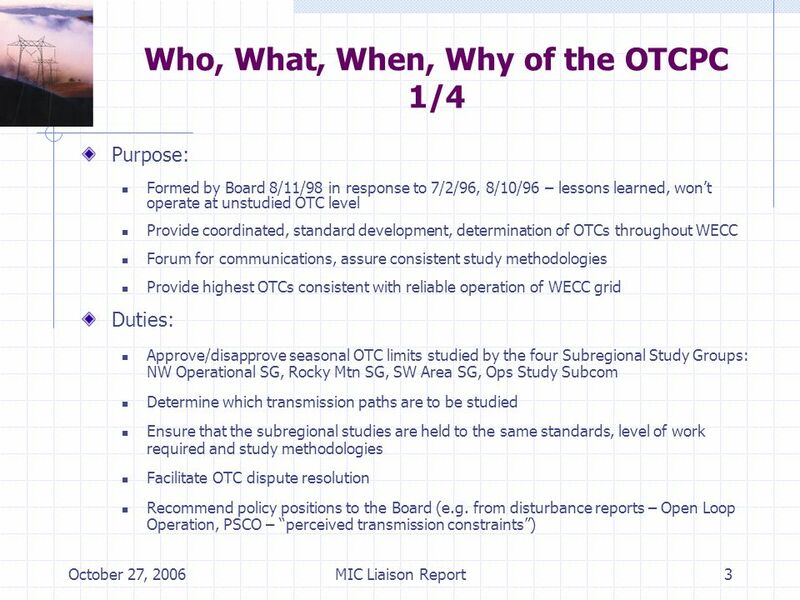 Standards of Conduct Question – Availability of Study Center Work Products OTCPC and Regional Subgroups meeting attendees have early transmission sensitive information – Propose to post preliminary study results on WECC website at time of Regional Subgroup internal distribution. Use of Seasonal OTC at higher limit while project in Phase 2 Use of higher OTC requires that responsible party is known for reductions dictated by nomogram relationships. Other criteria: Facilities in service, WECC Project Review group do not object, Must becritical load serving need verified by reliability authority. 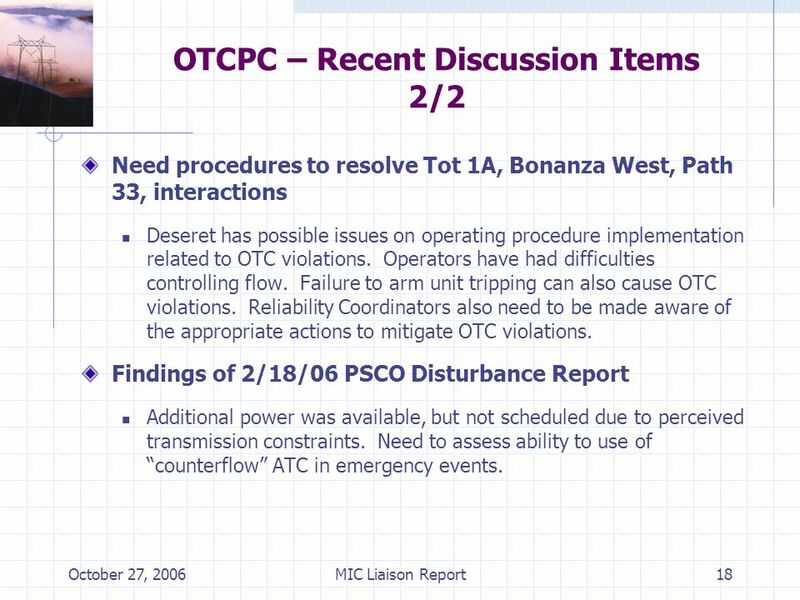 18 October 27, 2006MIC Liaison Report18 OTCPC – Recent Discussion Items 2/2 Need procedures to resolve Tot 1A, Bonanza West, Path 33, interactions Deseret has possible issues on operating procedure implementation related to OTC violations. 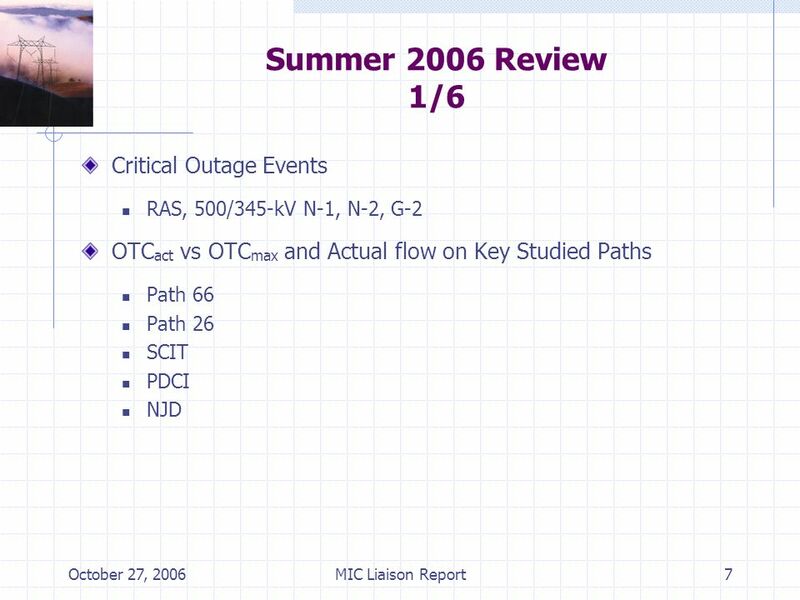 Operators have had difficulties controlling flow. Failure to arm unit tripping can also cause OTC violations. Reliability Coordinators also need to be made aware of the appropriate actions to mitigate OTC violations. Findings of 2/18/06 PSCO Disturbance Report Additional power was available, but not scheduled due to perceived transmission constraints. 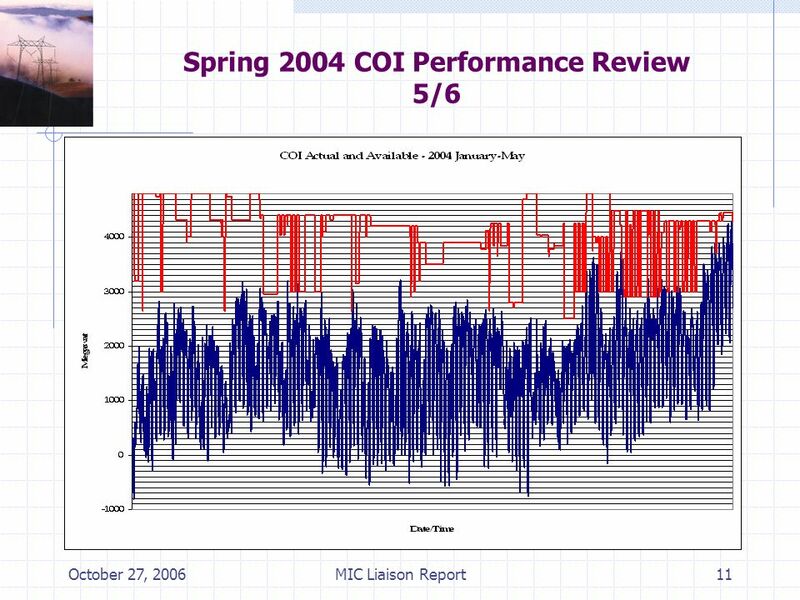 Need to assess ability to use of counterflow ATC in emergency events. 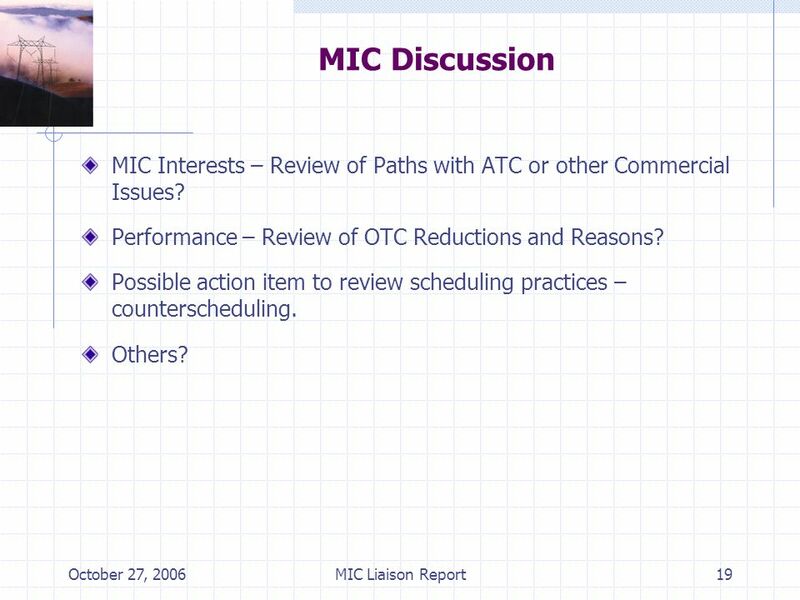 19 October 27, 2006MIC Liaison Report19 MIC Discussion MIC Interests – Review of Paths with ATC or other Commercial Issues? Performance – Review of OTC Reductions and Reasons? Possible action item to review scheduling practices – counterscheduling. Others? 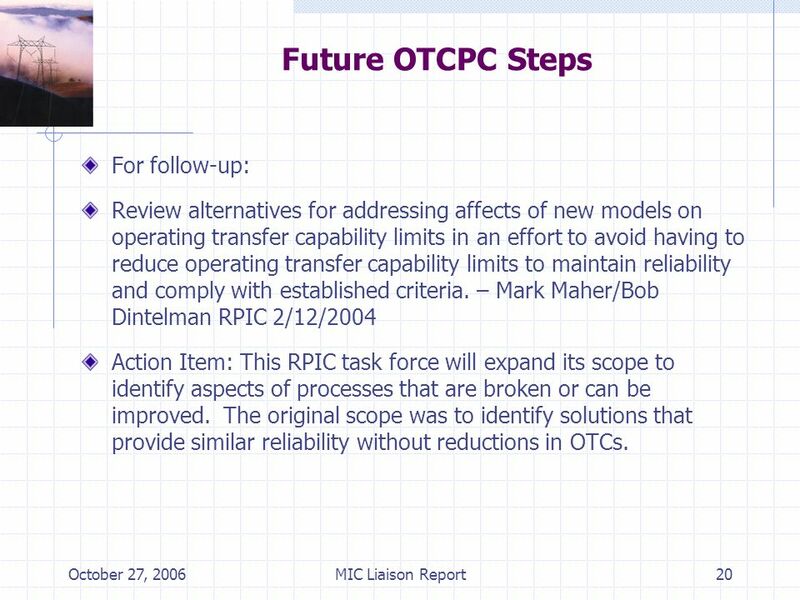 20 October 27, 2006MIC Liaison Report20 Future OTCPC Steps For follow-up: Review alternatives for addressing affects of new models on operating transfer capability limits in an effort to avoid having to reduce operating transfer capability limits to maintain reliability and comply with established criteria. – Mark Maher/Bob Dintelman RPIC 2/12/2004 Action Item: This RPIC task force will expand its scope to identify aspects of processes that are broken or can be improved. 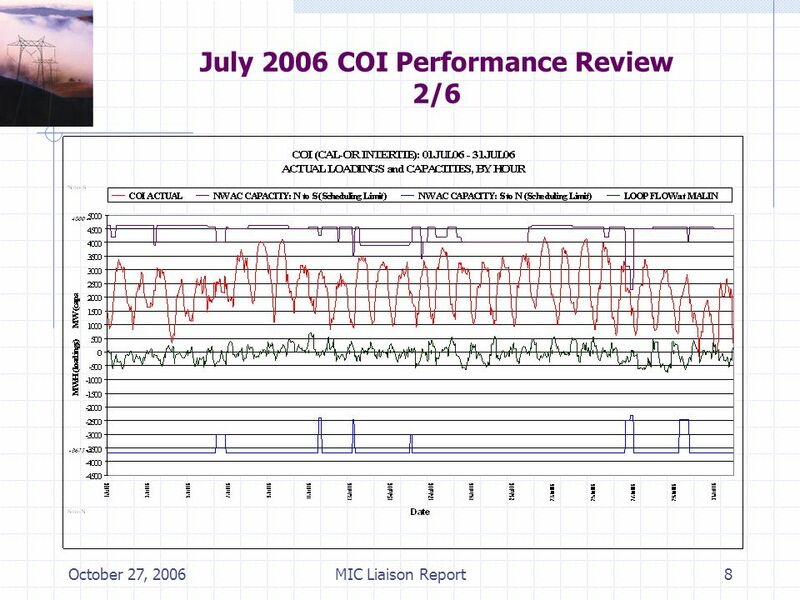 The original scope was to identify solutions that provide similar reliability without reductions in OTCs. 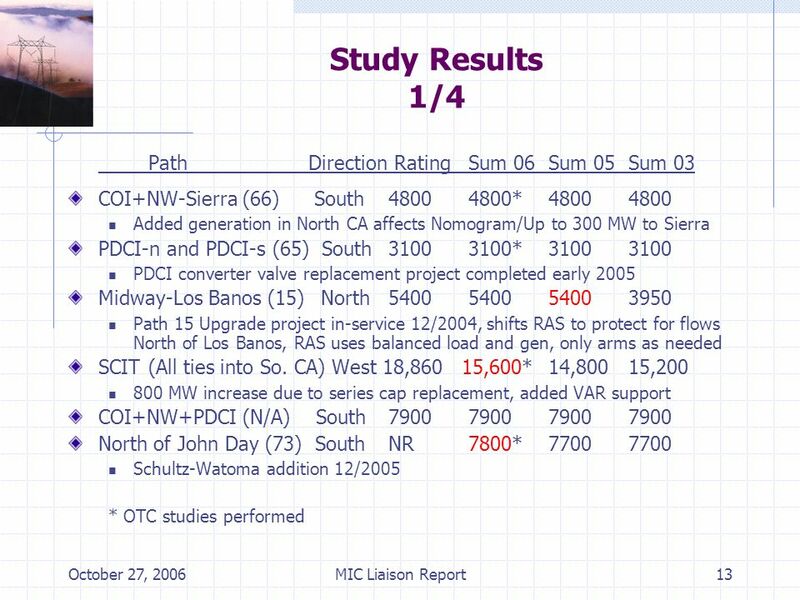 Download ppt "Western Electricity Coordinating Council MIC Meeting – Liaison Report Oct 24, 2006 – Salt Lake City Operating Transfer Capability Policy Committee (OTCPC)"
ColumbiaGrid Reliability Workshop October 1, 2007 Developmental and Staffing Reliability Functional Agreement (DSRFA) Details This program is the cornerstone. 2004 NERC, NPCC & New England Compliance Programs John Norden Manager, Operations Training, Documentation & Compliance August 31, 2003 RC Meeting. 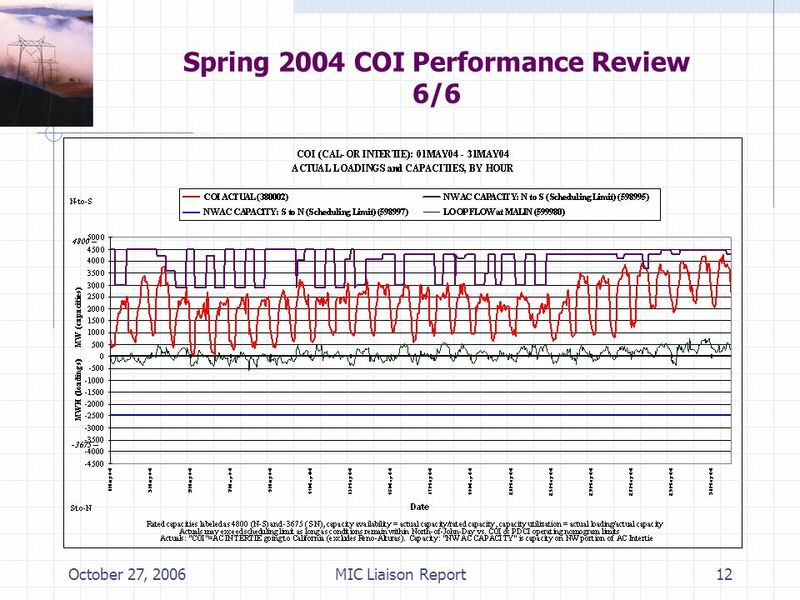 The Midwest ISO from a Transmission Owner Perspective. WECC Board of Directors April 21-23, 2004 Seattle, Washington WECC Procedure for Reporting of System Events Disturbance Reports Rod Maslowski OC Vice Chairperson. Central California Clean Energy Transmission Project PCC Meeting Vancouver, BC October 24, 2007. Remedial Action Scheme Reliability Subcommittee, RASRS WECC Operating Committee June 18-19, Gene Henneberg. NERC TPL Standard Issues TSS Meeting #146 Seattle, WA August 15-17, 2007 Chifong Thomas. WECC - Addressing Commercial Practices Ed Beck Chair, Market Interface Committee. 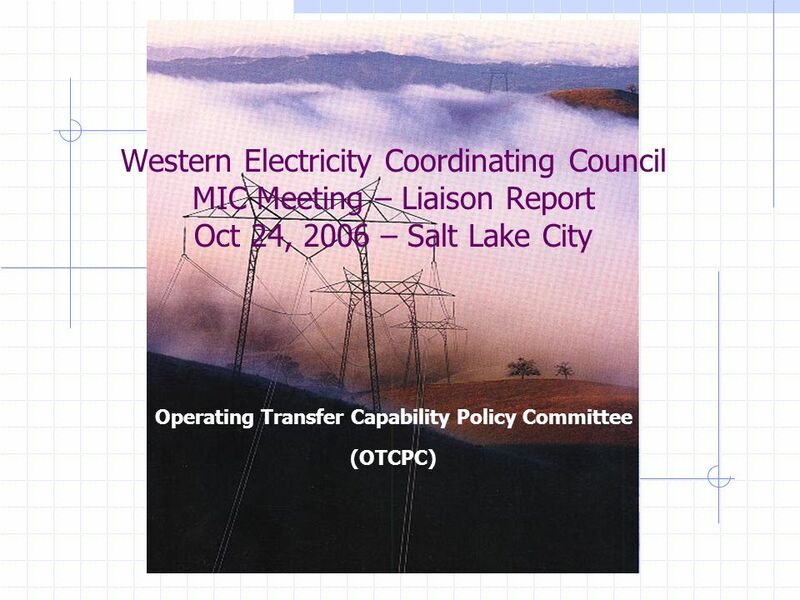 The Western Electricity Coordinating Council Operating Transfer Capability Policy Committee Richard Ferreira April 30, 2009. 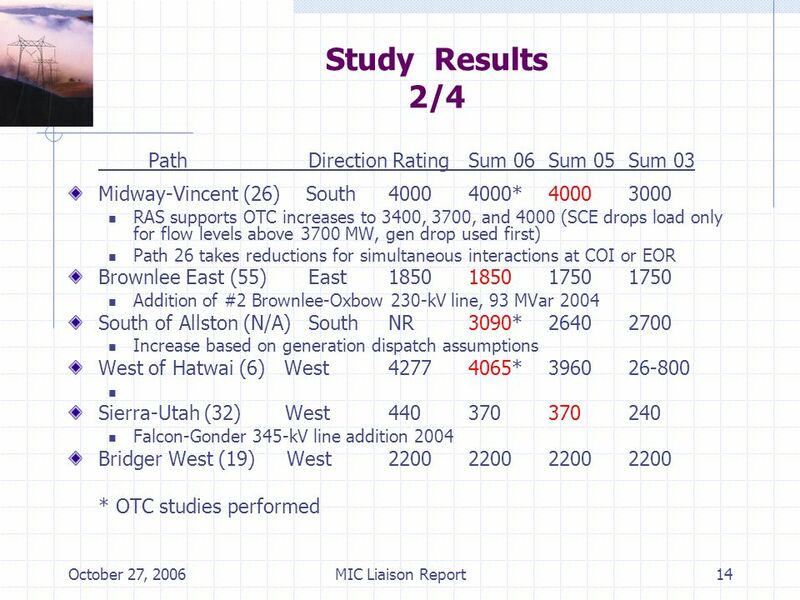 WESTERN ELECTRICITY COORDINATING COUNCIL OPERATIONS COMMITTEE June 18, 2009 Salt Lake City, UT Base Case Coordination System (BCCS) Request For Information. 2007 Goals. 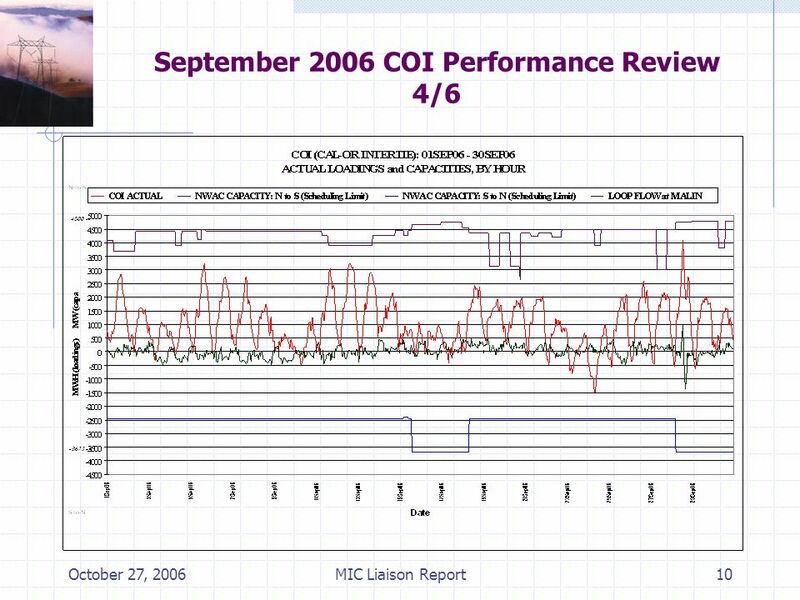 Introduction Western Electricity Coordinating Council (WECC) will be primarily defined throughout the 2007 year by Electric Reliability. 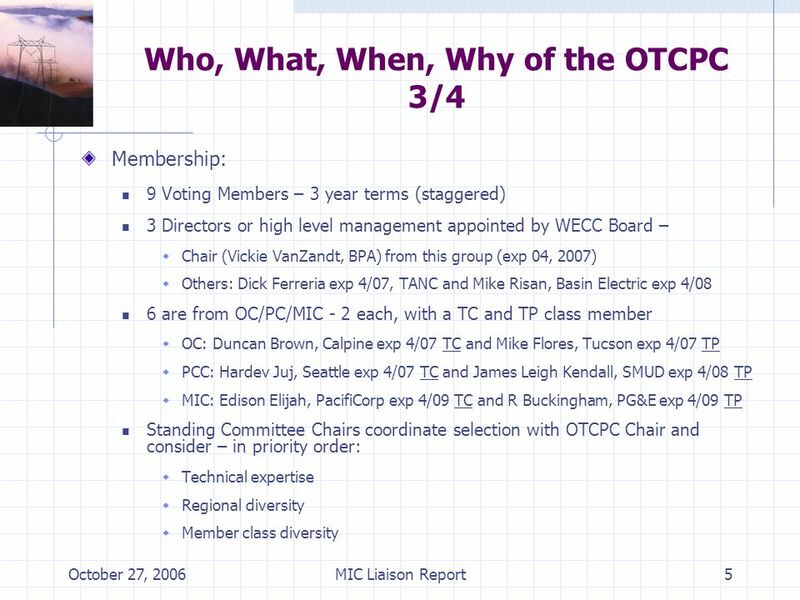 1 Report of the Planning Coordination Committee WECC Board of Directors Meeting April 21, 2006 San Diego, CA. Report of the Planning Coordination Committee December 2006 WECC BOD Meeting Cabo Del Sol, Los Cabos. 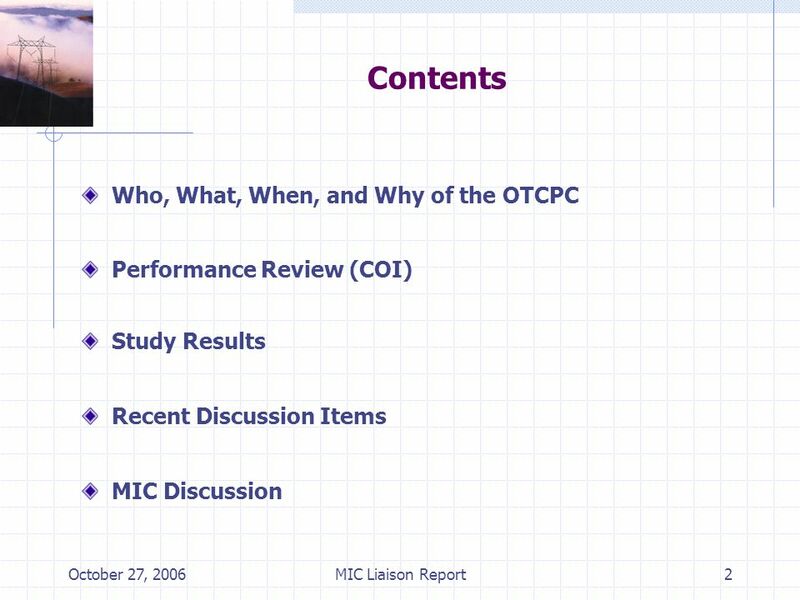 1 TSS Report PCC Meeting Salt Lake City, UT October 26-27, 2006. 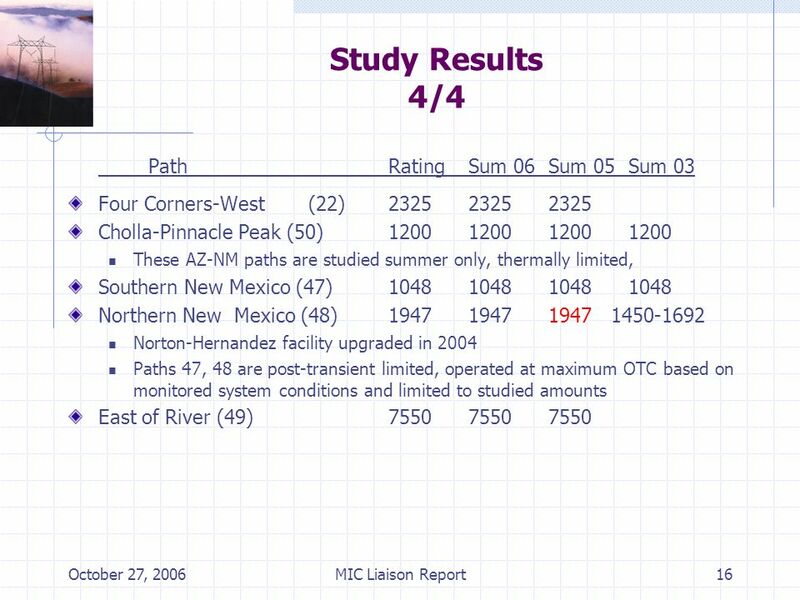 1 Western Interconnection 2006 Congestion Assessment Study Prepared by the Western Congestion Analysis Task Force May 08, 2006. Report of the Operating Committee Don Watkins Operating Committee Chair April 28, 2009. 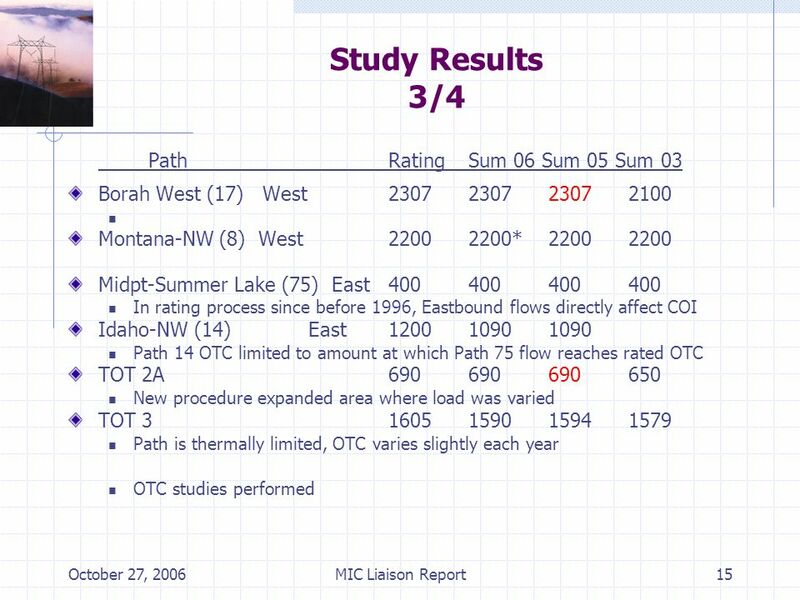 A new Nomogram Development POM- based tool - Application results in the Idaho Power System. Orlando Ciniglio, IPC Marianna Vaiman, V&R Energy WECC TSS.